Hackberry General Store started as a Conoco filling station and the Northside Grocery in 1934, according to Anthony Reichardt, who documented the place in a 1993 video when the roadside stop was shuttered. It closed about the time Interstate 40 replaced Route 66 from Seligman to Kingman in February 1978. Hippie artist Bob Waldmire showed up in 1993. 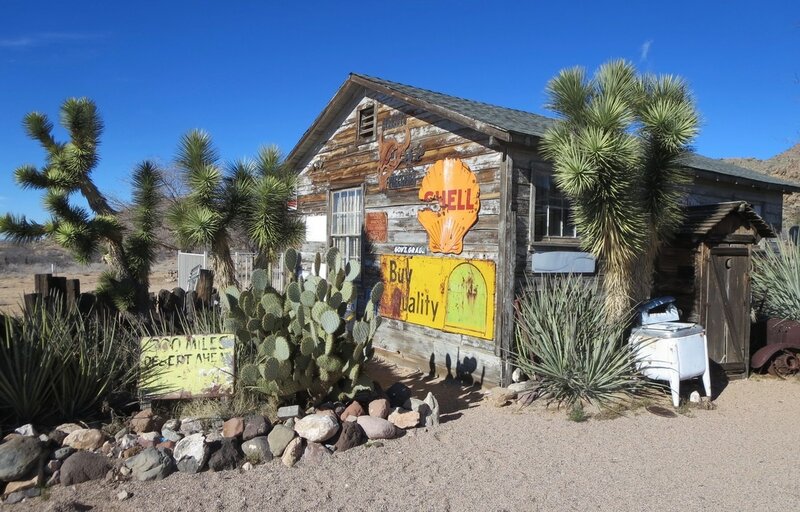 He set about transforming the 1930s gas station, general store and tourist cabins into what he called the International Route 66 Visitor Center in Hackberry, a perfectly funky stop along the old highway 25 miles east of Kingman. Waldmire, who created amazingly detailed post cards of Route 66 scenes in a style loosely akin to R. Crumb, was described as the "Johnny Appleseed of Route 66." Waldmire's father Ed was also a Route 66 entrepreneur who started selling corn dogs at the Cozy Dog Drive-in in Springfield, Ill., in 1946. The younger Waldmire bought the 22-acre Hackberry property and transformed it into a Route 66 attraction. 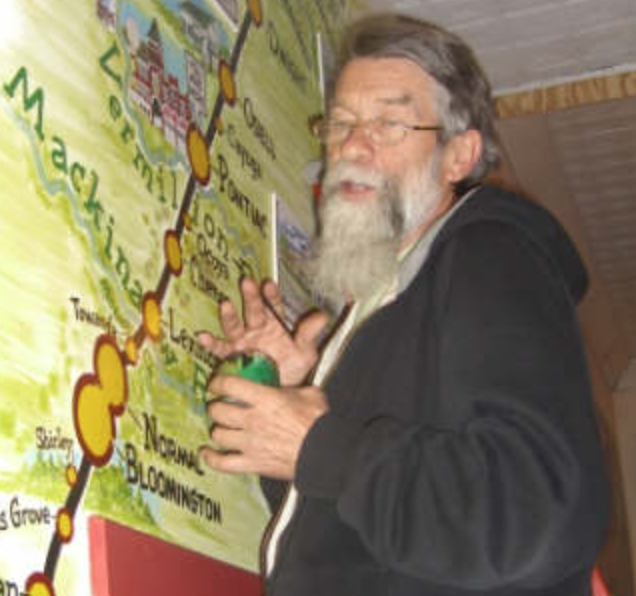 He lived there from October 1993 to September 1998, according to his friend William Crook Jr.
Crook published a 28-page pamphlet about Waldmire in 2015 called "An Artist's Life on Route 66." It includes photos from Hackberry, sketches and a self-portrait of Waldmire with his early 1980s VW camper bus that he drove 250,000 miles over nearly 30 years. Waldmire and his bus were said to be an inspiration for Fillmore the VW bus in the 2006 Pixar movie "Cars," but the cartoonist would not forge a deal with the filmmaker that could have been lucrative, according to Crook. "One thing Bob didn't do was to give up (his) vision like so many as they grew older. He tried to live his life in the most ethical way possible and to spread the word as an evangelist for animal rights, wilderness protection, the anti-war movement and multiple other causes." It has also been noted that Lizzie's Curio Shop in "Cars," the 2006 Pixar film, resembles Hackberry General Store. ​Crook described the 66 Visitor Center in Hackberry as "dark and sprawling with a kitchen and bedroom attached at the rear" and a swamp cooler providing relief from Arizona's summer heat. Waldmire sold his Hackberry creation in late 1998 and moved to Portal in far southeastern Arizona. He died at age 64 in 2009. His Hackberry roadside attraction lives on. 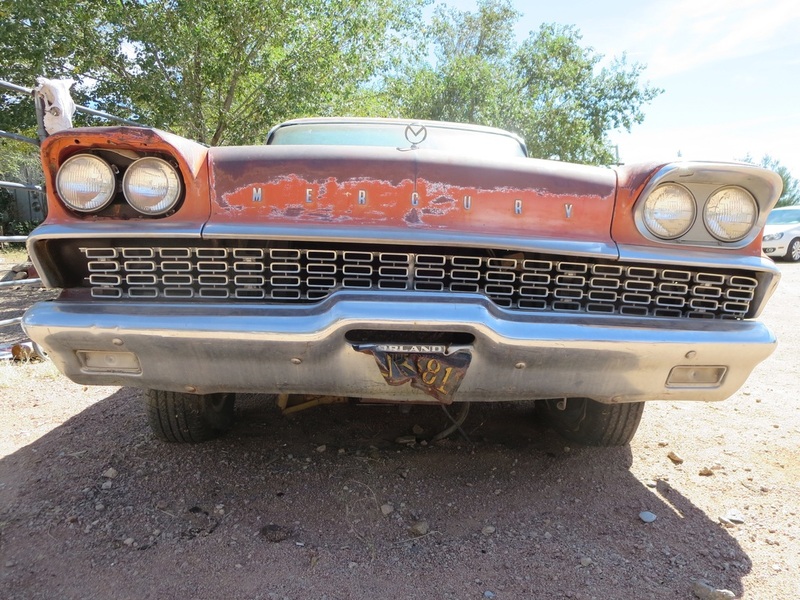 A big-iron '59 Mercury Commuter station wagon, with its bug-eating grill, is parked indefinitely outside the general store. John and Kerry Pritchard bought the place in 1998 and operated it for 18 years. Amy Franklin, who worked for the Pritchards for a decade, bought the general store in January 2016. "I consider myself the new caretaker of all the vintage collectibles that the Pritchards left for me ," she said. On a busy day from March to October, as many as 300 visitors stop in at Hackberry, Franklin added. "Whether it is their first visit to the store or their tenth time revisiting this place, everyone seems to dig the nostalgia and that's what we hope to maintain for everyone stopping here on their way across the country." 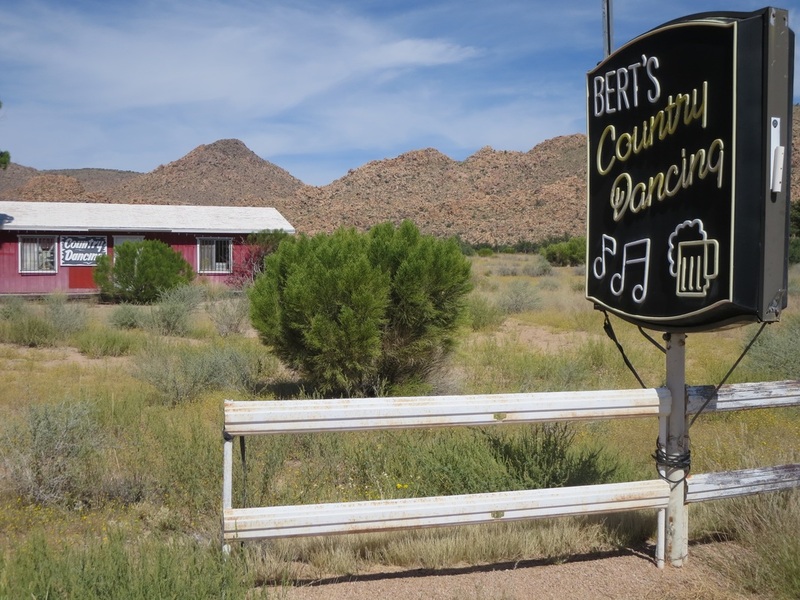 Down the road from Hackberry is Bert Denton's roadside dance hall, another fading relic of Route 66 west of Valentine. Bert's place, now closed, had a sign warning customers that "The banks don't sell beer (and) I don't make loans." It's odd to see a sign for a dance hall in the middle of nowhere on Route 66. Somehow it all fits together with the Hackberry General Store and its oddball collection of old signs and junk from a fading era of America that Waldmire and others curated. Hackberry is a ramshackle collection of signs, old gas pumps and battered metal objects surrounded by catci on a dusty lot. A closed dance hall is down the road from Hackberry in Valentine. 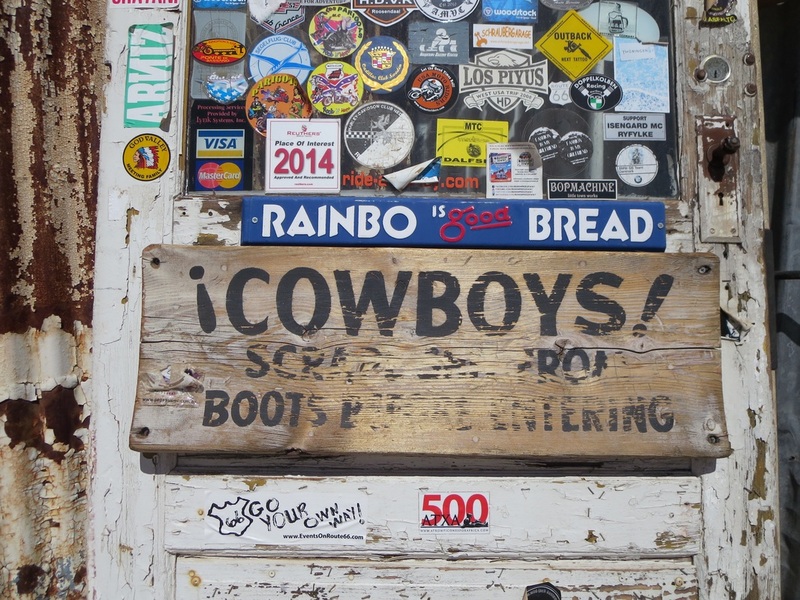 An old front door at Hackberry is plastered with stickers. This battered Mercury wagon with a mangled California license plate is unlikely to make the trip back to the Golden State from Hackberry.